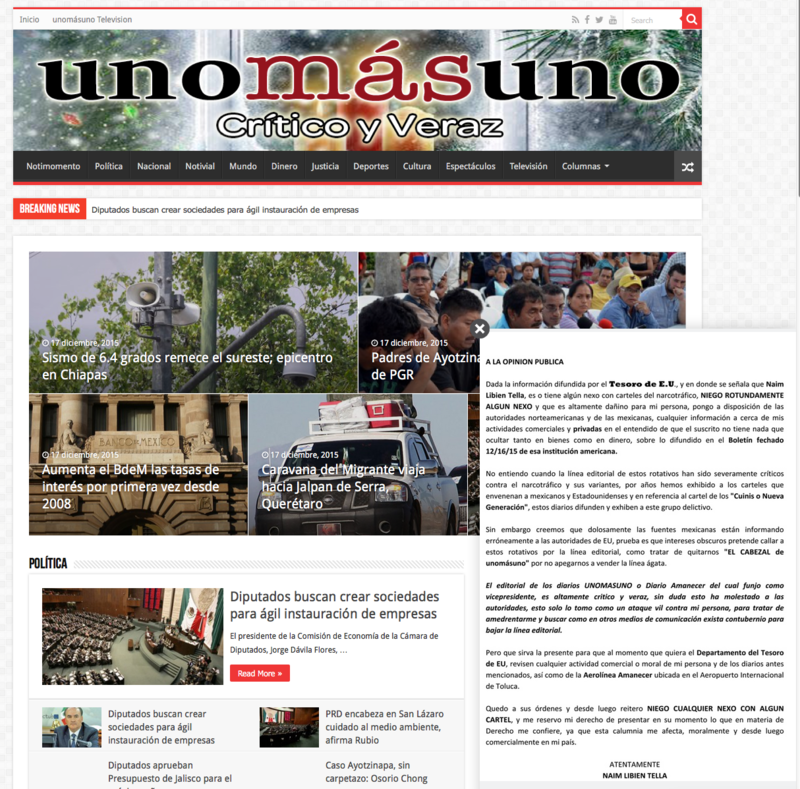 The U.S. government has accused the executive of two Mexican newspapers of having links to the Los Cuinis drug trafficking organization. 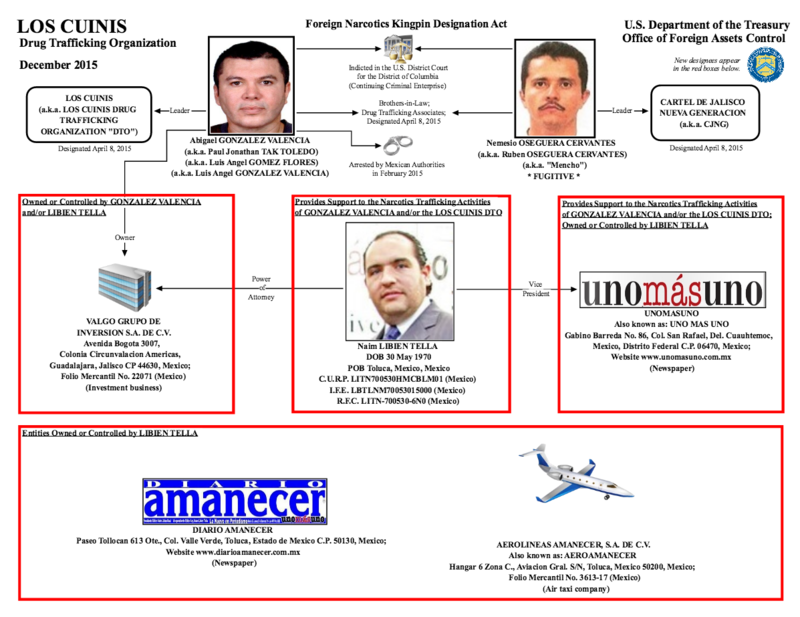 On Dec. 16, the U.S. Department of the Treasury’s Office of Foreign Assets Control (OFAC) designated businessman Naim Libien Tella and four entities, including newspaper Unomásuno in Mexico City and Diario Amanecer in Toluca, as “Specially Designated Narcotics Traffickers pursuant to the Foreign Narcotics Kingpin Designation Act,” according to a Treasury press release. Libien Tella is the vice president of Mexico City's Uno Más Uno and Toluca's Diario Amanecer. The other two businesses designated by the government were an air taxi company and an investment company. Much of the accusations made in the press release center around Libien Tella’s alleged relationship with Abigael Gonzalez Valencia, who the U.S. government says is the leader of Los Cuinis and “has been involved in drug trafficking since the 1990s.” Valencia was arrested in February 2015 and is awaiting extradition to the U.S., The Wall Street Journal reported. “As a result of today’s action, any assets these designees may have under U.S. jurisdiction are frozen, and U.S. persons are generally prohibited from engaging in transactions with them,” the Dec. 16 Treasury release said. After learning about the designation, Libien Tella published a letter in which he flatly rejected any link with drug trafficking and made available to U.S. and Mexican authorities “any information about my business and private activities [...]”. In the letter, he also stated that the newspapers had maintained editorial lines that were “severely” critical of “drug trafficking and its variants,” and added that he considered this an attack by the Mexican authorities in retaliation for this editorial line. He said that he believes Mexican sources are wrongly informing U.S. authorities, proving that there are interests who want to close these newspapers because of the editorial lines. Mexico's Attorney General's office has said it has not opened an investigation into Libien Tella, but will look at the U.S. Treasury’s report, according to newspaper El Universal. Los Cuinis have a connection to and are allied with the Jalisco New Generation Cartel (CJNG for its acronym in Spanish), according to the U.S. Treasury. According to Animal Político’s NarcoData project, the Sinaloa Cartel, of Joaquín ‘El Chapo’ Guzmán, and CJNG currently dominate the drug business in Mexico.